A pharmacy technician needs to have a well-rounded skill set to help patients with their medication needs. Important traits range from dependability and integrity to attention to detail and sound reporting skills, supporting their ultimate goal of ensuring that drug therapy is carried out safely and successfully. 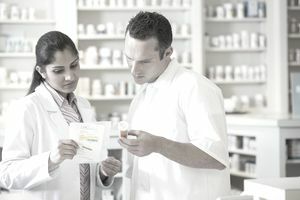 Certification as a pharmacy technician (CPhT) is achieved by passing the Pharmacy Technician Certification Exam (PTCE) and completing several hundred hours of training on-the-job comprising work with different prescription drugs, learning about pharmacy operations and adherence to ethical standards. The American Society of Health-System Pharmacists (ASHP) accredits pharmacy technician programs which are available at community colleges and vocational schools. Most certificate programs can be completed within a year or less; associate degree programs usually take two years. This is a sample resume written for pharmacy technician. You may simply read the sample below or download the Word template by clicking on the link. Experienced Pharmacy Technician drawing upon solid knowledge of brand and generic drugs to ensure accuracy in drug dispensing. Keen attention to detail complemented by superb communications skills; fluent in English and Spanish. Suggested implementation of stringent new processes for monitoring and forwarding patient reports of adverse reactions to authorities and pharmaceutical companies. Trained and mentored new hires to ensure uncompromised compliance with regulatory laws. Contributed to development of new inventory control system that optimized stock levels and greatly improved efficiency in disposing of outdated drugs. Here's a list of skills employers seek in a pharmacy technician. Skills will vary based on the job for which you're applying, so also review our list of skills listed by type of skill and job.